will this fit the Onan Marquis 5.5 BGM -FA 26105H , off a 1999 Motorhome? 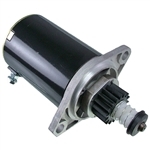 Yes, the correct generator starter motor for your Onan Marquis is 191-2158. The 191-2416 replaces that model, so this will work for you.